Chattanooga is a mecca for climbers, bikers, and backpackers alike, but the city also offers an array of scenic hikes for beginners and families. Whether you’re visiting for a week or just a weekend, there are plenty of pristine hiking trails close to town worth checking out. No trip to the Scenic City would be complete without soaking up some of the city’s breathtaking views. You have hundreds of options to choose from when it comes to hiking in the city, but here are five family-friendly trails close to town that everyone will enjoy. Reflection Riding is the perfect place to spend an afternoon. With more than 300 acres of unspoiled natural areas, families can explore mountain slopes, wildflower paths, or the creek on the property. The Indian Profile Trail provides an easy-to-navigate portrait of the park. The 2.7-mile loop trail offers families the opportunity to indulge in panoramic views of the park. Keep your eyes open and you may spot some of the local wildlife. Take a stroll through the Wildlife Wonderland or Snake Tail Alley to meet some of the more than 40 species that call the nature center home. Animals living in the Wildlife Wonderland are either threatened or endangered, and the center works to rehabilitate and release injured wildlife as well as taking part in breeding programs to help restore threatened populations. Some of the most popular residents are the highly endangered Red Wolves. These animals serve as ambassadors to help kids and families learn more about Tennessee’s natural environment and the important role animals play in it. Just minutes from downtown Chattanooga, Glen Falls Trail is an excellent choice for an afternoon outing as a family. This short trail is chock-full of unique features. Beautiful rock formations guide hikers through the forest and over a bridge. A stone stairway leads through a unique rock doorway. A creek leads you past cascades and to the falls where you can dip your toes in the water. It’s as close to a fairy tale as you can get. Keep your eyes open because there is always something new just around the corner, which makes this trail is especially fun for kids. Greenway Farm is a beloved local spot for biking, hiking, running, canoeing, and more. The park features a variety of trails and differing landscapes. 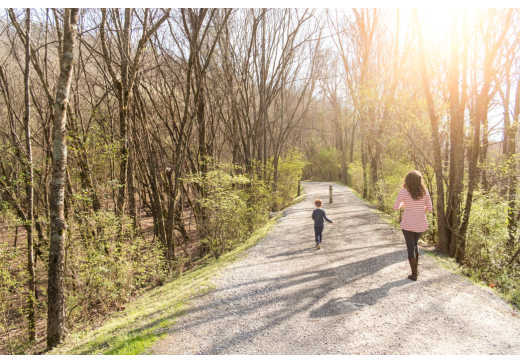 Visitors will enjoy a peaceful walk along North Chickamauga Creek, which winds throughout the property for more than two miles. 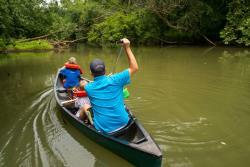 This quiet waterway zigzags beneath a beautiful and vibrant canopy of trees, and the flat trail is ideal for families looking for a slow-paced yet scenic outdoor adventure. You may even consider packing a lunch because this is a wonderfully serene spot for a picnic. Another attraction worth visiting along the Greenway Trail is the quarry, which was originally excavated by the Tennessee Valley Authority as a source of limestone for the Chickamauga Dam. Gently sloping paved trails lead the way to the beautiful limestone spectacle. Once at the top, massive sheer cliffs give way to a pool of pristine blue water below. Swimming and diving are not allowed but the view is worth the walk regardless. A short hike beneath deciduous forest leads to this unique and awe-inspiring view. 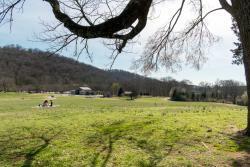 It’s a picturesque location for families to reflect and enjoy Chattanooga’s natural surroundings. Located across from downtown at Moccasin Bend, the Blue Blazes Trail offers scenic views of Lookout Mountain. The thick forest and overhead canopy make this trail ideal if you want to get lost in the woods without actually getting lost. Halfway through the 2-mile loop, the dense vegetation opens up to reveal a breathtaking view of the Tennessee River set against the backdrop of Lookout Mountain. The flat and easy trail makes this a brief but great excursion for kids and families. History and the great outdoors are blended at Cravens House, a fantastic trail for families who want to enjoy time together while learning more about our nation’s history. High atop Lookout Mountain, the trail winds downhill, offering panoramic views of the city. This short stroll leads to Cravens House, the only remaining Civil War era structure on the mountain. Once on site, explore the area around the historic home that served as headquarters for both the Confederate and Union armies during the Civil War. 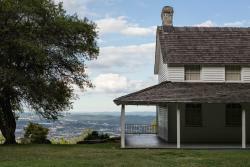 If the refreshing mountain air leaves you wanting more, visit nearby Point Park for picturesque views of the city and an opportunity to learn about Chattanooga’s Battle Above the Clouds.